More than 260 UltraRes Plant® models have been added for 2014. A breakthrough in 3D plant technology, UltraRes Plant® models change according to the season, grow realistically (sprouting new foliage and branches), and are so realistic you can see the veins in the leaves. During movies and Realtime Walkthroughs, UltraRes Plant® models sway in the wind and in the fall deciduous trees change color and drop their leaves. Realtime Landscaping Plus 2014 now includes a total of 5,060 plants, including 4,130 high-resolution images, 470 3D models, and 460 UltraRes Plant® models. Our graphics engine has been enhanced for improved realism and performance. 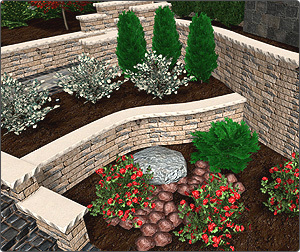 View your landscape designs with subtle lighting and shadows, detailed surfaces, ultra-realistic plants, and much more. Walk through your designs in real-time, create life-like screen shots, and create HD movies which you can upload to YouTube or other websites. The maximum lot size has been increased to over 100 acres, allowing you to create designs which are twice as large as before. The maximum terrain elevation has also been doubled to over +/- 300 feet (91 meters), making it even easier to match the topology of your existing property. 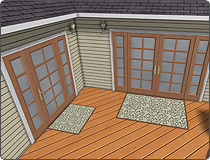 Realtime Landscaping Plus 2014 includes 56 new patio and entry doors. Each door's size, shape, and color scheme can be easily customized as desired. We are proud to include beautiful landscaping stones and pavers by R.I. Lampus, as well as elegant deck lighting from Highpoint. These new products give you even more ways to visualize your landscape design ideas. Many changes and improvements have been made to help you recreate the topology of your property. Regions, Paths, and Path Graders now all support true vertical cuts, making elevated planting beds, raised or sunken walkways, and other challenging terrain features easier to create. Retaining Walls now have more options for cutting the terrain, including the ability to specify the cut distance, how quickly the cut tapers off, and start and end cut angles. 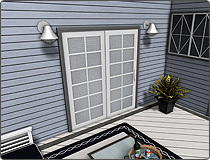 34 new premium outdoor wicker furniture accessories have been added. Add new patio sets to your landscape designs, including tables, chairs, couches, daybeds, and even loungers. 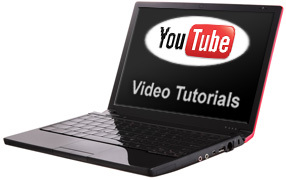 Getting started is easier than ever with many brand new video tutorials. Our new landscaping tutorials cover all general aspects of our Realtime Landscaping software, and are free to view by new users and existing landscapers alike. Even more high quality landscape design tutorials are being produced and will be added over time. 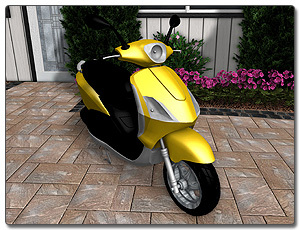 New high-quality vehicles have been added to help make your landscape designs even more realistic. New high quality landscaping accessories have been added for increased realism. Add air conditioners, residential propane tanks, and more to your landscape design. 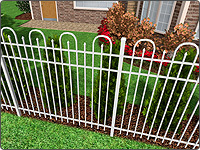 The Fence tool now has 19 additional styles to choose from when designing a fence for your landscape. Each of these styles can be fully customized as needed, and you are even able to save your own styles for future designs. 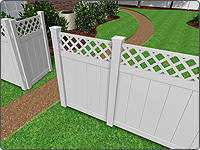 Choose from ornate, picket, privacy, or even lattice style fences. Change materials, adjust board spacing, add a new post cap, and more. Realtime Landscaping Plus is now easier than ever to use, even for those with no prior CAD experience. Browse the UltraRes Plant® library by season, edit the shape of objects with one keystroke, copy/paste objects while preserving their layer, and more. Both new and advanced users alike will appreciate the smooth, user-friendly experience of our award-winning landscape design software. 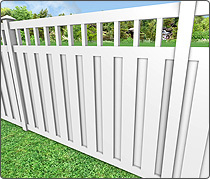 A new library of highly detailed panel privacy fences and matching gates have been added. 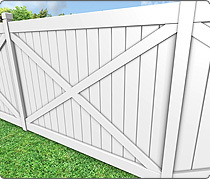 Add a panel fence or gate with just a few clicks. The default material is white, but you can easily change it to wood, metal, or other material. 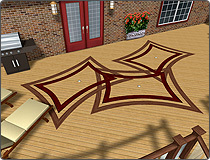 Imported objects created in the newly released SketchUp Make, or download them from the Google 3D Warehouse. 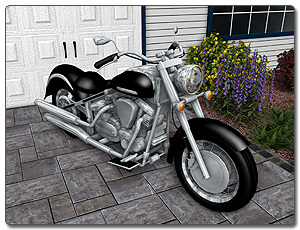 Models created in previous versions of SketchUp can also be imported. Many other additions have been included to make Realtime Landscaping Plus faster, more realistic, and better than ever. 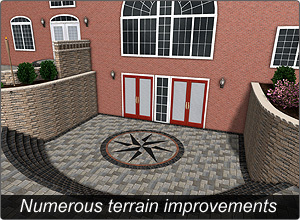 UltraRes Plant® models set a new standard for realism in landscape design. A technological breakthrough, these new plants realistically grow with age (actually sprouting new branches and foliage), change according to the season, and are so detailed you can even see the veins in the leaves. 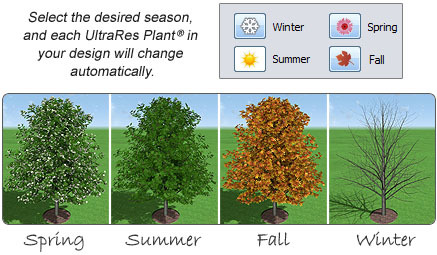 UltraRes Plant® models gently sway in the wind during videos and Realtime Walkthroughs, and in the fall deciduous trees change color and drop their leaves. 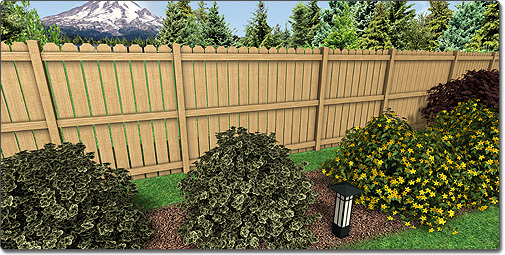 Realtime Landscaping Plus 2013 includes over 200 UltraRes Plant® trees and shrubs, bringing the total number of plants to over 4,800 (4,130 high-res images, 470 3D models, and 200 UltraRes Plant® models). 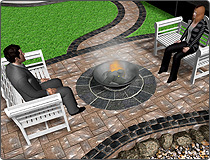 Add an unprecedented level of realism to your landscape designs with animated people. Simply place a character into your landscape and select their animation. For animations that involve swimming, walking, or jogging, you can even indicate a movement path. 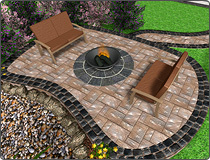 Realistic horizons can now be added to your landscape designs in just a few clicks. Choose skylines with mountains, deserts, forests, fields, tropical scenery, and more. 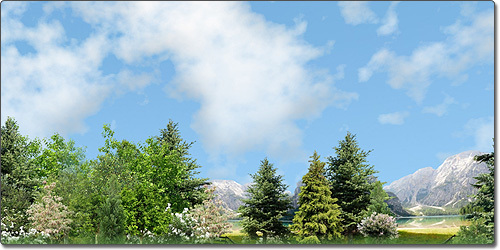 Add even more life to your landscapes by showing animated clouds lazily drifting and changing shape over your designs. Adjust the color of both the sky and the cloud cover, as well as the density of the clouds. Clouds will automatically animate during Realtime Walkthroughs and videos. Prefer clouds that don't move? Simply set the sky type to "Picture" for a stationary effect. Using the new Google Maps Import Wizard, it is now easy to add satellite imagery to your design. Add straight or curved railing to patios, slopes and hills, paths, or wherever else you need it. 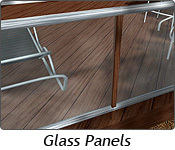 Choose one of 14 pre-built styles, or create your own custom styles using a wide selection of materials including wood, wrought iron, glass, and chrome. 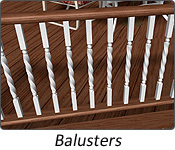 Railing placed on patio stairs or other uneven surfaces can be angled or stepped. Managing layers is now faster, easier, and more robust. By switching to a "list" system, it is much easier to manage detailed designs with dozens of different layers. When editing layers, the layer management window is now resizable for greater convenience. Additionally, the maximum number of layers has been increased to 1,000, allowing for a practically infinite level of design organization. 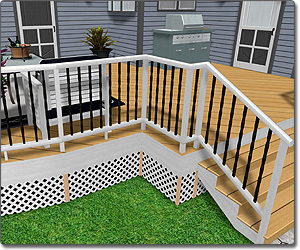 Patio Stairs can now support different materials for the body, riser, and tread portions of each set of stairs. Patio Stairs have also been enhanced to display the tread orientation accurately and realistically, even with wide and curved stairs. Enjoy an updated interface with completely redesigned icons. All icons are now clearer, more detailed, and larger. Accustomed to the previous interface? Your workflow will not be hindered as the layout has not changed. 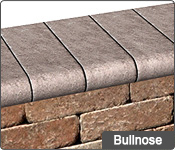 The selection of Unilock pavers has been updated and enhanced to match Unilock's current product line. 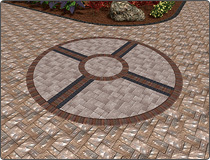 In addition to Unilock pavers, materials are available from other manufacturers, or in generic varieties. 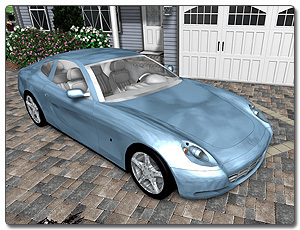 A Loft tool has been added to allow for the quick and easy creation of advanced custom objects. The Loft is one of seven tools that can be used to make custom objects and accessories, such as outdoor furniture. 3D booleans are now available for use with all modeling tools and custom models. Use booleans to subtract one object from another, add two objects together, or delete all but the intersecting portions of two objects. 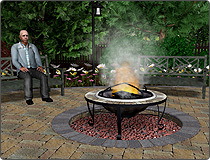 Add realistic animated smoke and steam anywhere they are needed in your landscape designs. Smoke and steam can be used for firepits, chimneys, fireplaces, grills, and more. Dozens of other additions, improvements, and changes have been made in order to make Realtime Landscaping Plus the best landscape design software on the market. 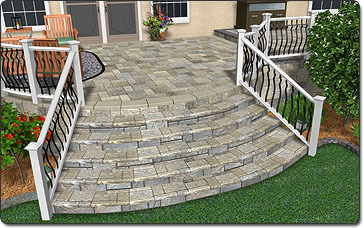 Realtime Landscaping Plus 2012 includes new tools for designing accents in decks, patios, walkways, and more. Create accents using any material, and use them to add a decorative edge to your landscape designs. Create designs with even more realism using Realtime Landscaping Plus's new enhanced surface detail feature. 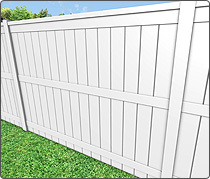 This exciting new technology greatly enhances the overall realism of your landscape designs. 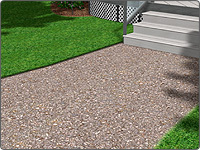 Borders can now be added to paths, driveways, and more with just the click of a button. Borders are simple to use, yet highly customizable. Adjust border materials, widths, positions, and even toggle sections of borders on or off. Automatic borders are supported on patios, regions, and paths. 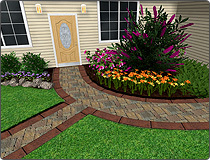 Borders may be added in any material needed, such as brick, paving stone, or even mulch. 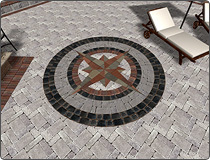 Support for custom material directions are now available in Realtime Landscaping Plus 2012. 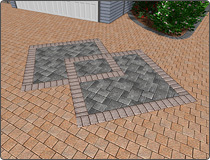 This powerful tool allows for paths with unique designs and layouts, providing directional control of bricks and pavers. Caps and coping thickness and overhang can now be customised as needed. 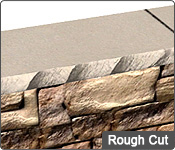 Easily create flat, bullnose, rough cut, and seamless coping for retaining walls and patios borders. 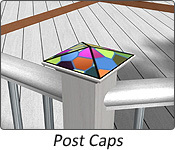 Includes new pillar designs from Unilock, or create your own custom pillars. 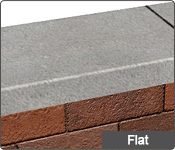 It is now quick and easy to create stepped retaining walls of virtually any style. 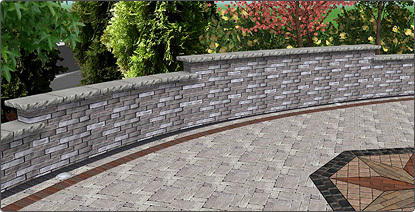 Simply click the "Stepped" option and freely adjust the height of each retaining wall segment as needed. Stepped retaining walls are very versatile and can be created on flat, sloping, or uneven terrain. Stepped retaining walls may be straight or curved, stepping in an ascending, descending, or even a staggered pattern. 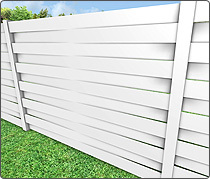 Hundreds of products from 7 popular companies have been added to Realtime Landscaping Plus, including Jerith aluminum fences, Belgard hardscapes, Philips Hadco outdoor lighting, Amarr garage doors, Kichler lighting, Eldorado stone and brick veneer, and Unilock pavers. 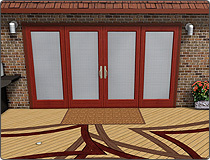 Several hundred new landscaping objects have been added to Plus, including new furniture, vehicles, fire pits, doors, windows, landscape lights, greenhouses, sheds, bridges, and much more. A special effect has been added that causes normally flat regions to appear raised and realistic. For example, grass can now appear to grow several inches high instead of appearing flat when placed next to patio or mulch regions. The 3D Edge Effect appears in both design and walkthrough views, helping you create even more realistic and compelling ladnscape designs. 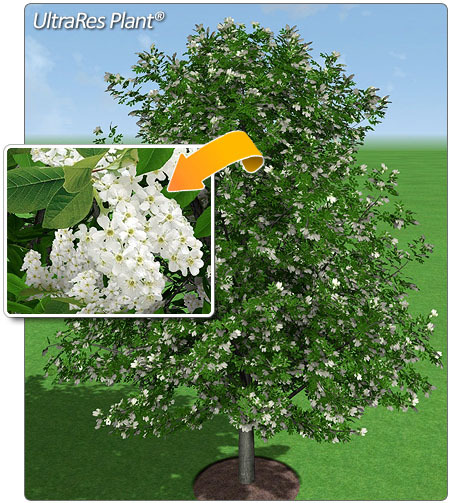 Nearly a thousand new high quality plants have been added to Realtime Landscaping Plus. These plants were taken from many different regions around the United States and Japan, providing even more variety to the already staggering plant database and bringing the total number of plants to 5,000. Hundreds of thousands of 3D objects created in SketchUp can be downloaded for free from the Google 3D Warehouse. Realtime Landscaping Plus has been updated to support the new version of SketchUp, increasing compatibility and the opportunities for new content. Creating movies in Realtime Landscaping Plus is now faster, easier, and higher quality than ever! Videos of your Realtime Walkthroughs can now be created in the WMV format with enhanced compression options that allow for movies to be created quickley while taking up less space. Additionally, support for uploading to YouTube has been added. When your movie is completed, simply click the "Upload to YouTube" button and follow the instructions. Many other additions and changes have been implemented based off of customer suggestions and comments, such as enhanced Realtime Camera functionality, improved Path Grader behavior, enhanced retaining wall caps, and much more. We fully stand behind our software. If you are not 100% satisfied with Realtime Landscaping Plus, simply return it within 30 days for a full refund. More.